Justice Antonin Scalia spent his final hours at a Texas ranch in the company of a secretive society of hunters that has existed for more than 300 years. Several members of the 35-strong hunting party at the Cibolo Creek Ranch where Scalia was found dead are known to be current or former members of The International Order of Saint Hubertus. John Poindexter, the owner of the ranch, is known to hold a leadership position in the Order, as does C. Allen Foster, a prominent Washington lawyer and Scalia’s traveling companion for the trip. According to records unearthed by the Washington Post, private planes owned by Wallace ‘Happy’ Rogers III and A. J. Lewis III were also chartered to the ranch, but it is unclear if the men were there. 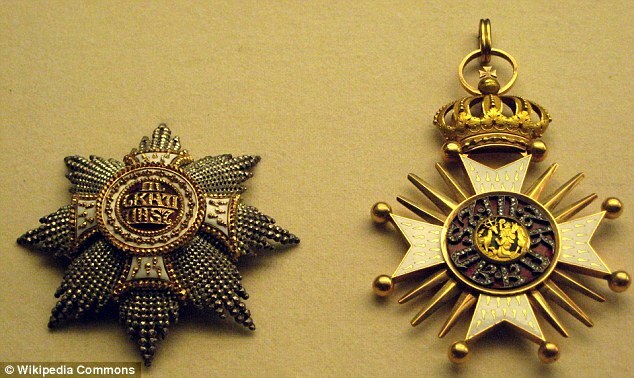 Rogers, a prominent hunter and museum owner, and Lewis, the owner of a restaurant wholesale business, are both former members of the Order’s elite. According to a website for the Order, it was created in 1695 by Count Anton von Sporck, ruler of Bohemia, which now forms part of the Czech Republic. The aim was to gather the finest Noble hunters from across Bohemia, Austria, and the Austo-Hungarian Empire, ruled by the Habsburg family, one of the most powerful European dynasties. 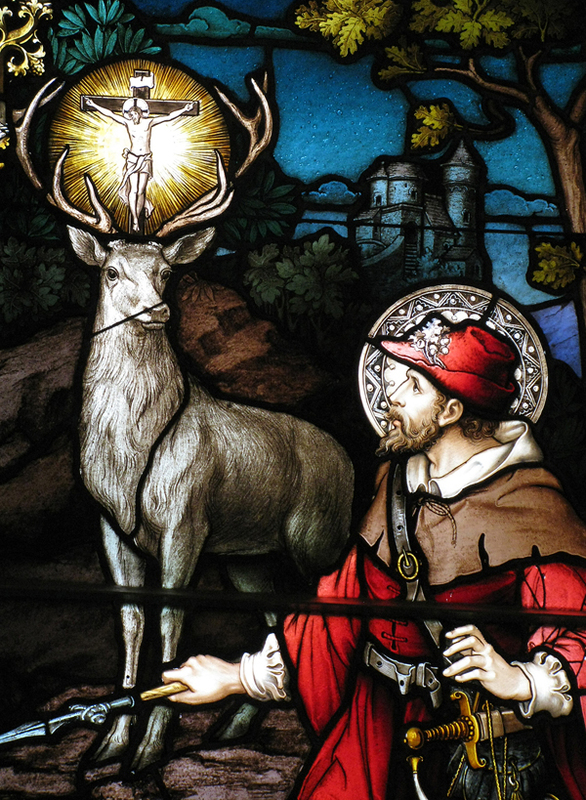 It was named after Saint Hubertus, the patron saint of hunters, mathematicians, opticians, and metalworkers. The Order’s aim was to promote the gentlemanly sport of hunting, considered one of the finest pursuits a young Nobleman could take up during the 17th Century, and to promote the conservation of game animals on which the sport relied. The Order was disbanded after Austria fell into the hands of Adolf Hitler during the Second World War, and refused to become part of the Nazi propaganda machine. According to the group, Hermann Goering, who founded the infamous Gestapo police force, asked to become a member in 1938, and executed the Grand Prior when he was turned down. The Order was restituted in 1950, and in 1966 the first American branch was established at the Bohemian Club in San Francisco. It is under the Royal Protection of King Juan Carlos of Spain, Archduke Andreas Salvator of Austria and the Grand Master is Istvan von Habsburg Lothringen, Archduke of Austria, Prince of Hungary. Asked about the Order, Poindexter responded: ‘There is nothing I can add to your observation that among my many guests at Cibolo Creek Ranch over the years some members of the International Order of St. Hubertus have been numbered. The revelations that a secret society was attending the ranch alongside Scalia comes amid controversy and conspiracy after it was decided that there would be no autopsy for the Supreme Court Justice. Descriptions of the judge being found with a pillow ‘over his face’, the fact that the death was certified over the phone, and the suddenness of his passing all contributed to theories that his death may not have been natural. However, his son Eugene has since said there is ‘no doubt’ in his mind that his father died of natural causes. 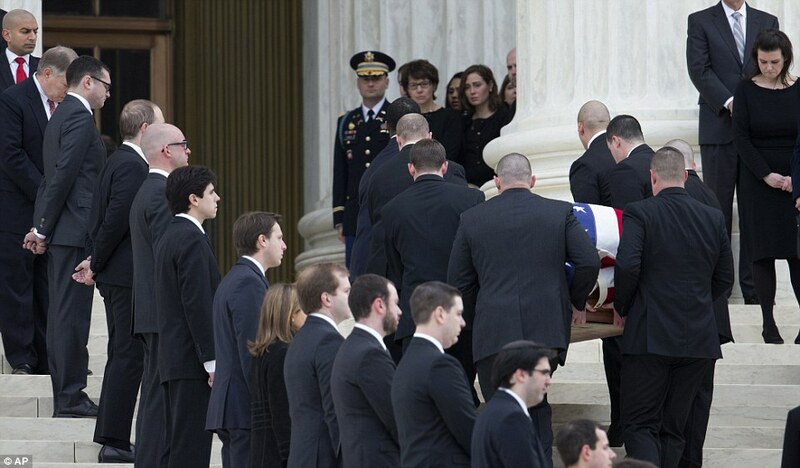 Thousands paid tribute to Scalia, a lifelong Catholic, at his funeral last week. A sheriff’s incident report, released on Tuesday, shows there was ‘nothing out of the ordinary’ in Scalia’s room when he was found dead. Pope Francis-Bergoglio, (again) has called on Catholic leaders to seek a ban on the death penalty exclaiming that ‘Thou shall not kill applies to the guilty as well as the innocent’. Speaking to thousands at St. Peter’s Square, in the Vatican, the Pontiff asked politicians around the world to make ‘a courageous and exemplary gesture’ during the Church’s current Holy Year. He said: ‘I appeal to the consciences of those who govern to reach an international consensus to abolish the death penalty. Roman Catholic Theology: Men shall be sentenced to death for crimes of irreparable harm and or crimes which are particularly Perverted!! Francis made the comments to throw his weight behind an international conference against the death penalty starting on Monday in Rome and organised by the Sant’Egidio Community, a worldwide Catholic peace and justice group. In the past, the pope also denounced life imprisonment, calling it ‘a hidden death penalty’ and saying that more should be done to try to rehabilitate even the most hardened of criminals. Ever since the General Chapter of July, 2012, when under Bishop Fellay’s direction the Society of St Pius X took a decisive lurch towards a compromise agreement with Conciliar Rome, Catholics of Tradition have wondered where the two other SSPX bishops stand, Bishop Tissier de Mallerais (Bp. T) and Bishop de Galarreta (Bp. G), because both have been rather discreet in public since that time. However, firm words spoken by each of them last month have raised hopes for the future of the SSPX. Are the hopes justified? Catholics may need to remain on their guard . . . The Confirmations sermon of Bp. T given on January 31 in Saarbrücken in Germany could not have been more upright or clear. For instance: In the SSPX’s confrontation with Rome, it may never go in for compromise or double-dealing. We can never negotiate with Rome so long as the representatives of the Newchurch (sic) cling to the errors of Vatican II. Any talk of ours with Rome must be unambiguous, and have as its purpose the conversion of the Newchurch representatives back to our one and only truth of Catholic Tradition. No compromise or double-dealing until they have got over their Conciliar errors, and have converted back to the Truth. Admirable words! Uprightness is not Bp.T’s problem. He is no politician, God bless him. His problem is that when it comes to putting words into action, his “Fiftiesism” makes him obey his Superior and fall back in line with the politicians of SSPX HQ in Menzingen. Nothing indicates that this will not happen again this time, but we may always pray that, as the proverb says, “Even a worm will turn.” Bp. T is far from a worm, but he is hiding from himself, or genuinely cannot see, the full malice of Menzingen’s action. 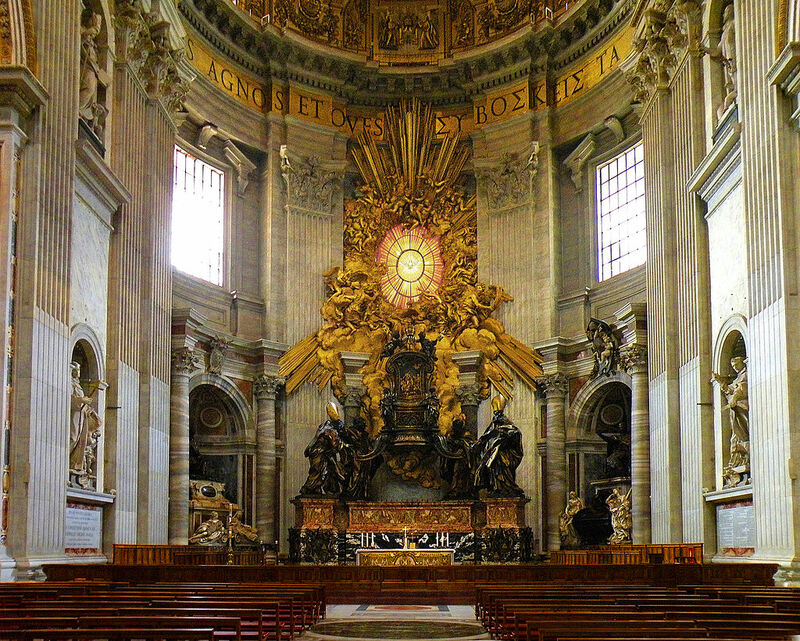 It is not just the unity and welfare of the SSPX which is at stake, but the Catholic Faith. On the contrary Bp. G is a politician. Unfortunately we do not have the full text of the conference he gave in Bailly, France, on January 17, because his exact words count, so we can only quote from a summary of his main thoughts: Rome’s latest theological and canonical proposals for a Rome-SSPX agreement remain unacceptable, but the Pope certainly wants an agreement and he is perfectly capable of overriding his own officials and of imposing a “unilateral” recognition on the SSPX. Such a recognition could definitely harm the SSPX internally, but if the SSPX had done nothing to obtain it, then there is nothing that the SSPX could do about it. However, Providence would once more watch over the Archbishop’s work. But, your Excellency, Menzingen has now for many years been doing all it can by political negotiation to arrive at official recognition by Rome, and its eventual “unilateral” arrival would be a mere pretense to deceive Traditionalists so as to sell out the SSPX under cover of claiming, no doubt with Rome’s permission behind th e scenes , that it was all Rome’s fault. But the fact would remain that the Archbishop’s Society would finally be betrayed, and you with your own “No, no, a thousand times no . . . but possibly, yes” would have to answer for not having done all you could and should have done to block its betrayal. In brief, that emergency lighting system of the Universal Church in Conciliar darkness, which is the SSPX, is itself flickering and in danger of no longer giving light. Therefore that repair team to sustain the emergency lighting, which is the “Resistance,” is still needed, and that team needs a sufficiency of good foremen. A third bishop for the “Resistance” is planned, as last year for March 19 at the monastery near Nova Friburgo in Brazil. 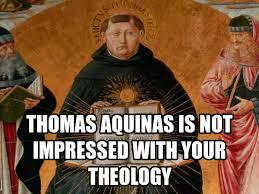 He is its Prior, Fr Thomas Aquinas, faithful warrior and veteran of the post-Conciliar war for the Faith. May God be with him, and with all the humble and faithful servants of God. Thus it is that the divine Founder of the Church, who willed that she should be a city seated on a mountain, gave her visibility; it was an essential requisite; for since all were called to enter her pale, all must be able to see her. But He was not satisﬁed with this. He moreover willed that the spiritual power exercised by ‘her pastors should come from a visible source, so that the faithful might have a sure means of verifying the claims of those who were to guide them in His name. Our Lord (we say it reverently) owed this to us; for, on the last day, He will not receive us as His children, unless we shall have been members of His Church, and have lived in union with Him by the ministry of pastors lawfully constituted. Honour, then, and submission to Jesus in His vicar! honour and submission to the vicar of Christ in the pastors he sends! O prince of the apostolic senate! Herald of our Lord! First pastor of the faithful! watch over the ﬂock entrusted to thee. Lead us through verdant pastures, feeding us with the nourishment of the word; and lead us, thus fed, into the heavenly fold, whither thou hast already gone. 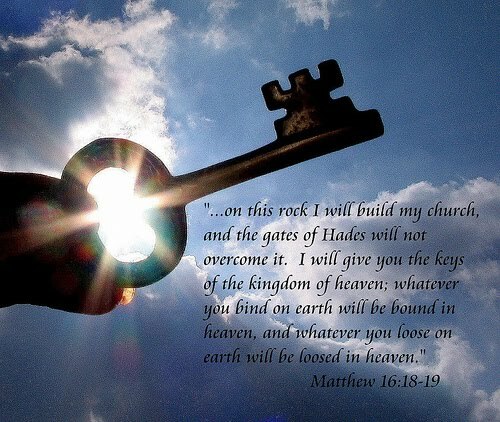 To thee, Peter, have been delivered the keys of heaven’s gate; and all things, both in heaven and on earth, acknowledge thy authority. ‘Tis thou that choosest the city where is to be established the rock of the true faith, the foundation of the building, on which the Catholic Church stands immovable. Thy shadow, as thou passest by, heals the sick; and Tabitha, that made garments for the poor, was raised to life at thy bidding. Bound with two chains, thou wast set free by an angel’s power; he bids thee put on thy garments and thy sandals, and lo! the prison door is opened. To the Father unbegotten, and to the only-begotten Son, and to the coequal Spirit of them both, be praise and kingly highest power. Amen. The Station is in the church of Saint Clement, Pope and Martyr. 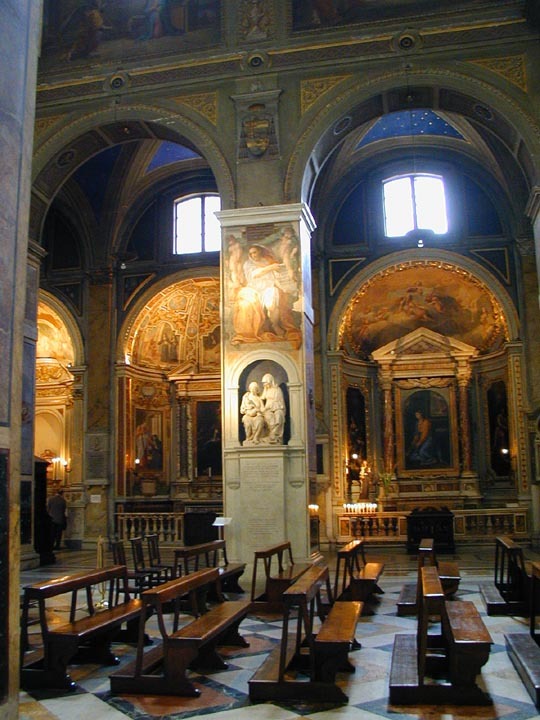 In this, more than in any other church of the city of Rome, there has been preserved the ancient arrangement of the early Christian basilicas. Under its altar reposes the body of its holy patron, together with the relics of Saint Ignatius of Antioch, and of the consul St. Flavius Clemens. 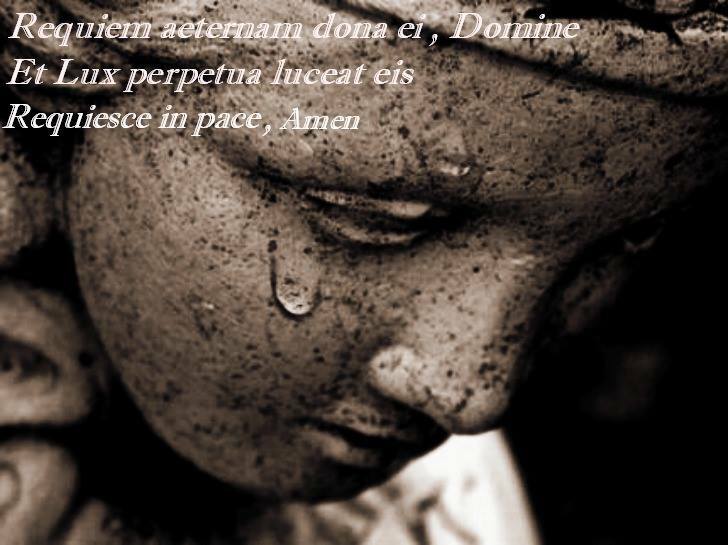 Statuit ei Dominus testamentum pacis, et principem fecit eum: ut sit illi sacerdotii dignitas in æternum. Ps. Memento Domine, David: et omnis mansuetudinus ejus. Gloria Patri. 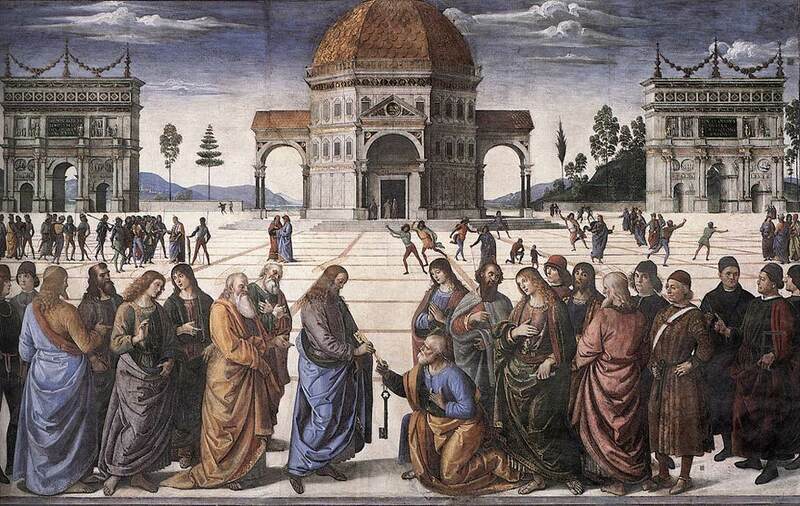 The Lord made to him a covenant of peace, and made him a prince: that the dignity of priesthood should be to him forever. Ps. O Lord, remember David: and all his meekness. Glory be to the Father. 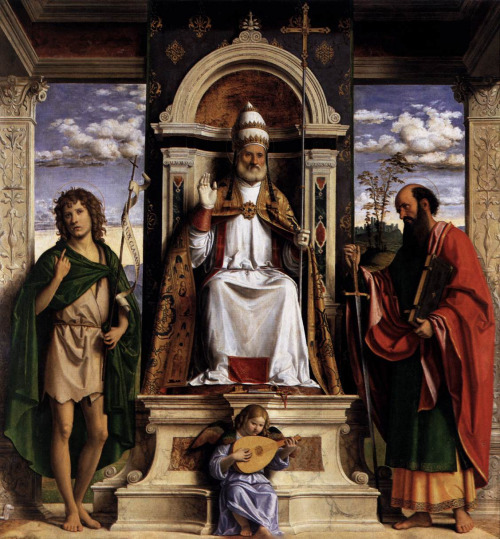 O God, Who, committing to blessed Peter, Thine Apostle, the keys of the heavenly kingdom, didst bestow on him the pontifical function of binding and loosing, grant that, by the help of his intercession, we may be delivered from the bonds of our sins. Who livest and reignest. O God, Who by the preaching of the blessed Apostle Paul didst teach the multitude of the Gentiles, grant us, we pray Thee, that, honoring his commemoration, we may experience the benefit of his patronal influence with Thee. Through our Lord. Grant, we beseech You, almighty God, that Your servants who discipline the body by fasting from food, may strive after righteousness by abstaining from sin. Through our Lord. Peter, an apostle of Jesus Christ, to the strangers dispersed through Pontus, Galatía, Cappadocia, Asia, and Bithynia, elect according to the fore-knowledge of God the Father, unto the sanctification of the Spirit, unto obedience, and sprinkling of the blood of Jesus Christ; grace unto you and peace be multiplied. Blessed be the God and Father of Our Lord Jesus Christ Who according to His great mercy hath regenerated us unto a lively hope, by the resurrection of Jesus Christ from the dead, unto an inheritance incorruptible and undefiled, and that can not fade, reserved in heaven for you, who by the power of God are kept by faith unto salvation, ready to be revealed in the last time Wherein you shall greatly rejoice, if now you must be for a little time made sorrowful in divers temptations: that the trial of your faith, much more precious than gold (which is tried by the fire), may be found unto praise, and glory, and honour, at the appearing of Jesus Christ our Lord. Let them exalt him in the church of the people; and praise him in the chair of the ancients. Let the mercies of the Lord give glory to him; and his wonderful works to the children of men. At that time, Jesus came into the quarters of Cæsarea Philippi, and He asked His disciples, Saying, Whom do men say that the Son of man is? But they said, Some, John the Baptist, and other some, Elias, and others, Jeremias, or one of the prophets. Jesus saith to them, But whom do you say that I am? Simon Peter answered, Thou art Christ, the Son of the living God. And Jesus answering, said to him, Blessed art thou, Simon Bar-Jona, because flesh and blood hath not revealed it to thee, but My Father Who is in Heaven: and I say to thee, that thou art Peter, and upon this rock I will build My Church, and the gates of hell shall not prevail against it; and to thee I will give the keys of the kingdom of Heaven; and whatsoever thou shalt bind upon earth, it shall be bound also in Heaven; and whatsoever thou shalt loose on earth, it shall be loosed also in Heaven. We beseech Thee, O Lord that the prayer of the blessed Apostle Peter may commend the sacrifices and supplications of Thy Church, so that the celebration we hold for his glory may profit for our pardon. Through our Lord. Sanctify, O Lord, the offerings of Thy people by the prayer of Thine Apostle Paul, that those things which are pleasing to Thee by Thine own institution may become the more pleasing by the favour of his intercession. Through our Lord. May this sacrificial gift offered in appeasement and praise, O Lord, make us worthy of Your protection. Through our Lord. Ecce agnus Dei, ecce qui tollit peccatum mundi. Let the gift we offer bring us joy, O Lord, that, as we declare Thee wonderful in Thine Apostle Peter, so through him we may share the generosity of Thy forgiveness. Through our Lord. Sanctified by the mystery of salvation, O Lord, we pray that his prayer may fail us not, by whose patronage Thou halt granted us to be governed. Through our Lord. May this Communion, O Lord, cleanse us of sin, and make us partakers of heavenly healing. Through our Lord. Eternal rest grant unto him, O Lord. And let perpetual light shine upon him. May Justice Antonin Scalia rest in peace. 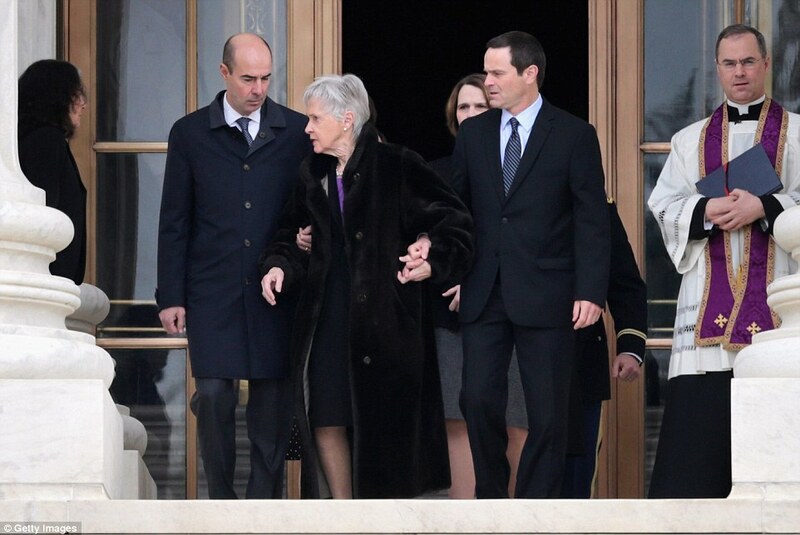 The grieving family of Justice Antonin Scalia have led hundreds of mourners in a final farewell to the powerhouse judge as his body lies in repose in the Supreme Court. 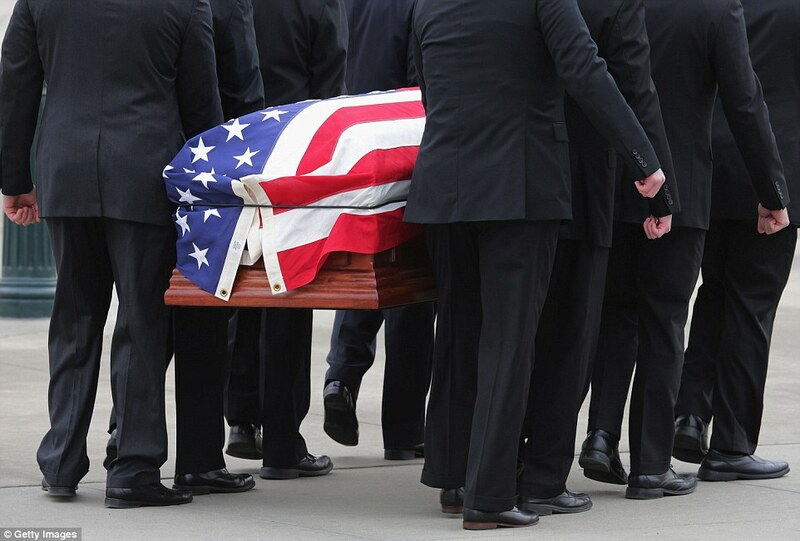 Draped in an American flag, his casket was carried into the Great Hall by eight pallbearers from the court’s police. 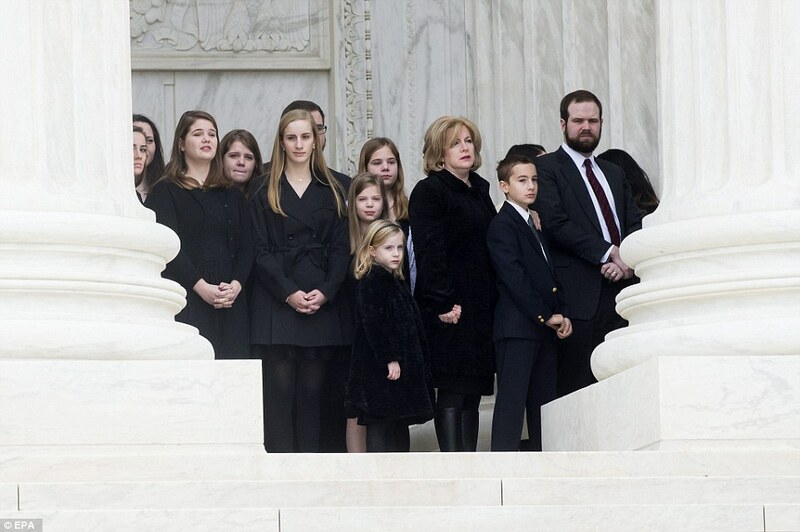 A total of 180 law clerks lined the steps of the Supreme Court as Scalia’s casket was carried in to the hall, followed by his frail widow, Maureen Scalia, and eight of their nine children. 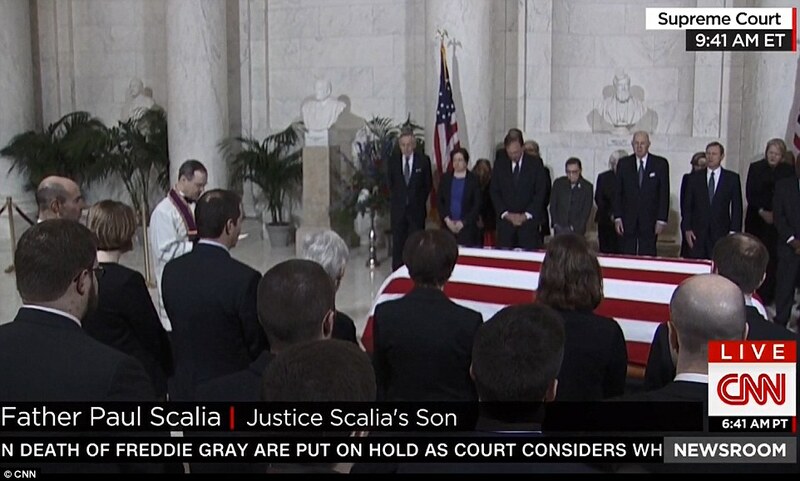 Fellow Supreme Court justices and Scalia’s family stood in silence as they paid a touching tribute to the towering, divisive judge. 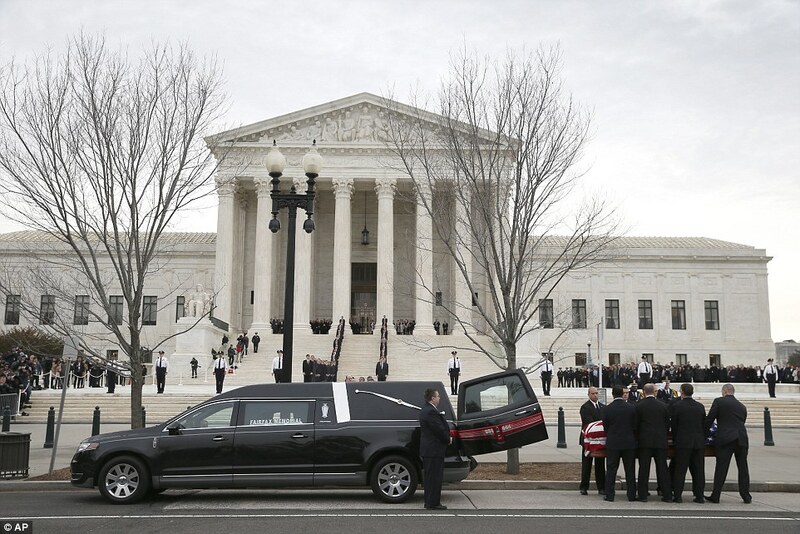 Hundreds of people lined the streets in Washington, DC, as the hearse carrying Scalia arrived this morning. President Barack Obama and First Lady Michelle will be among those to pay their respects at the court, where Scalia spent nearly three decades as one of its most influential members, later today. He will NOT attend Scalia’s funeral mass on Saturday, where Vice President Joe Biden is expected to be in attendance. 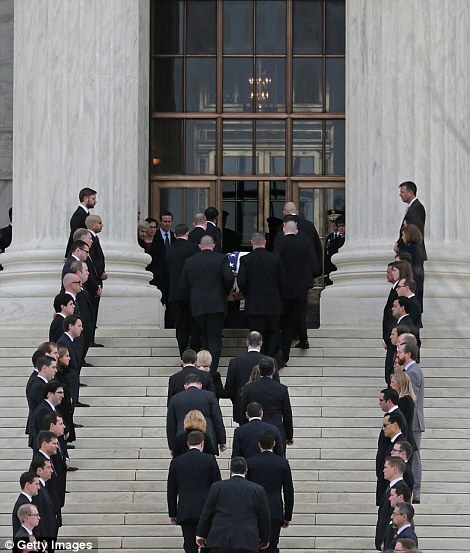 In a break from tradition, fellow and former Supreme Court justices waited inside the hall for Scalia’s arrival. 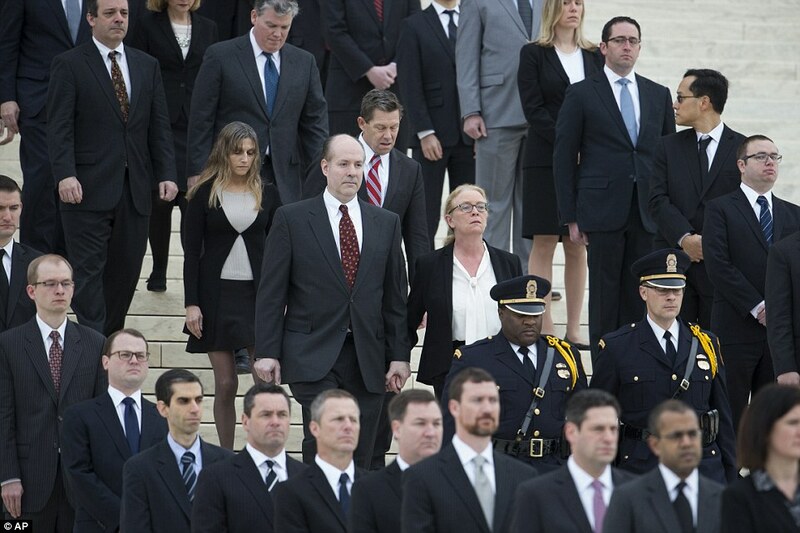 Previously, following the death of a justice, they have waited on the steps alongside other officials and dignitaries. 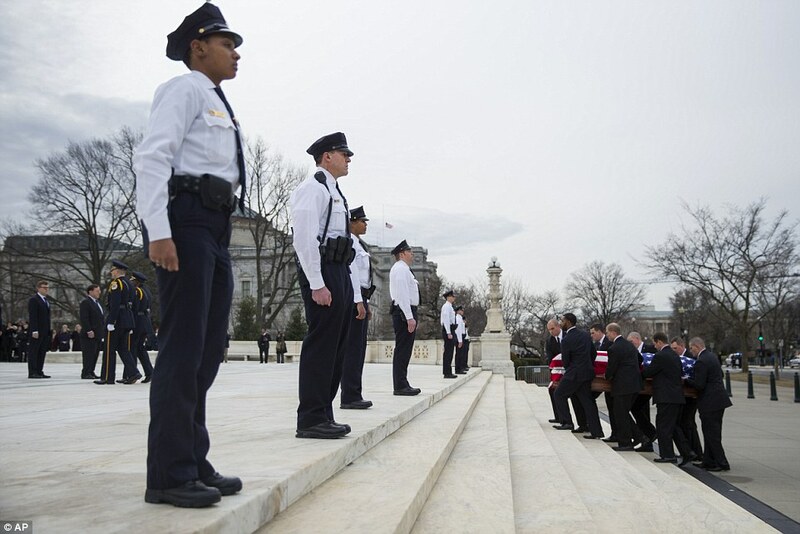 Supreme Court police served as pallbearers to carry the casket up the marble steps into the court’s Great Hall. The procession passed between two long lines of 180 former law clerks that stretched from the plaza to the court’s main entrance. 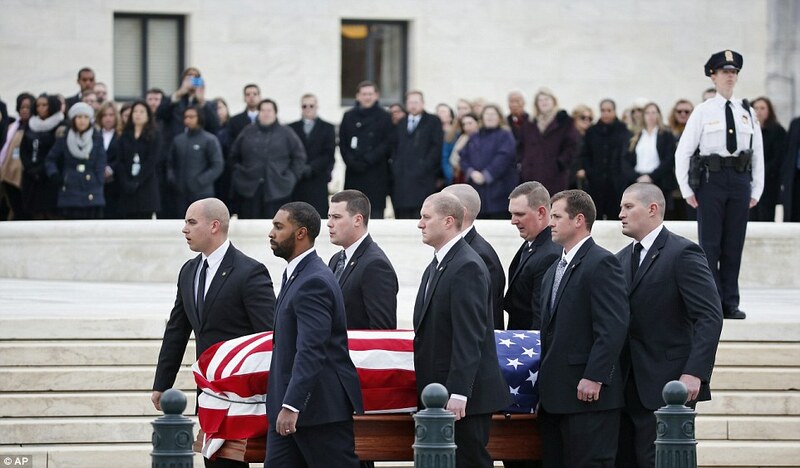 Another group of 12 former clerks serving as honorary pallbearers followed. 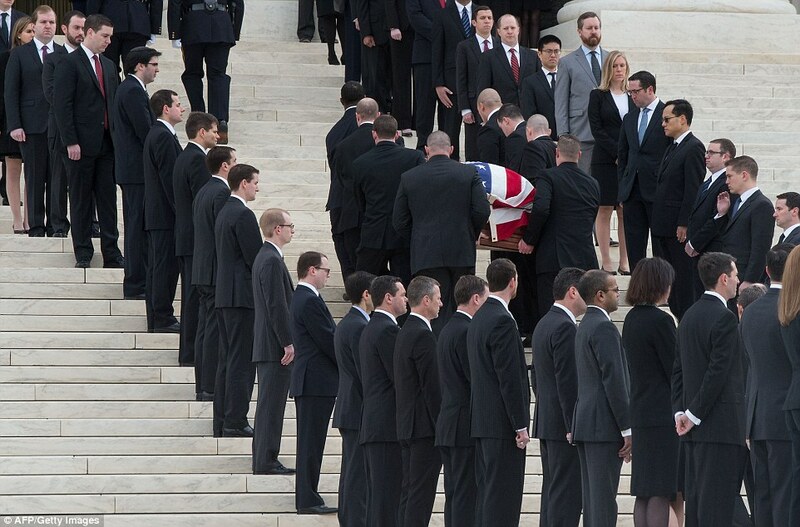 The clerks will take turns standing guard by Scalia’s body while he lays in repose. 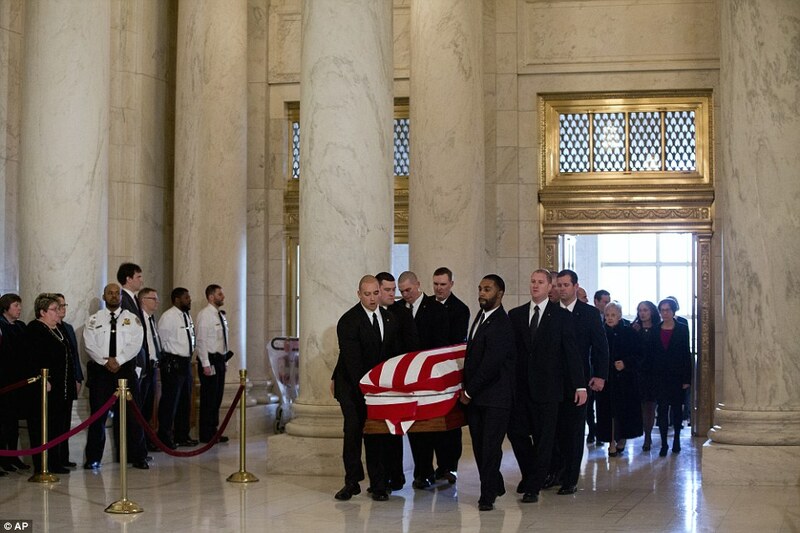 The procession then passed before the court’s eight current justices and the casket was placed on the Lincoln Catafalque – where President Abraham Lincoln’s coffin once rested at the Rotunda of the Capitol in 1865. Only six other Supreme Court justices have been given such an honor, Chief Justices Earl Warren, Warren Burger and William Rehnquist and Associate Justices Thurgood Marshall, William Brennan and Harry Blackmun, USA Today reported. 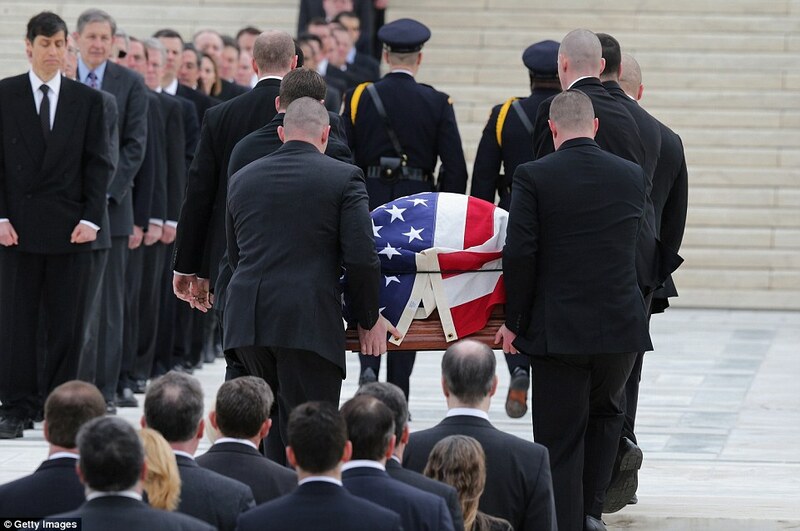 Several of the justices, particularly Elena Kagan, a liberal who was known to go on hunting trips with the staunchly conservative Scalia, looked emotional as they stood in a row while the casket was placed on a raised bier in front of them. 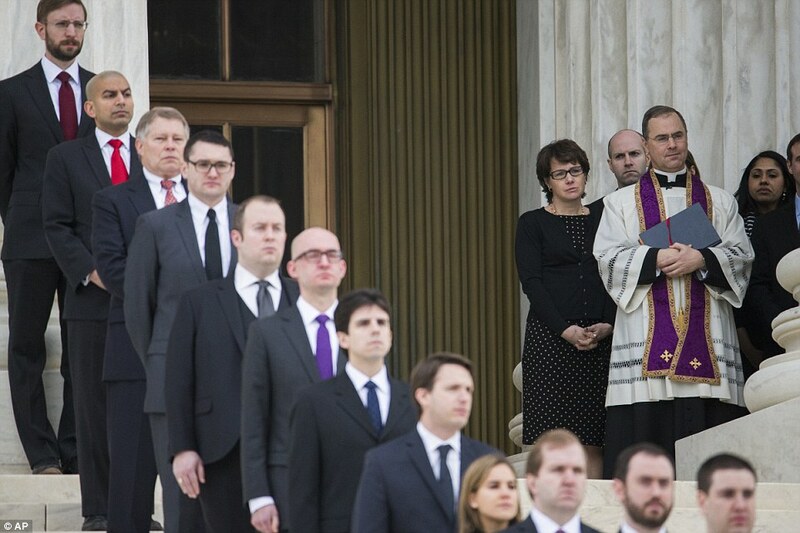 Chief Justice John Roberts, his hands clasped in front of him, bowed his head. 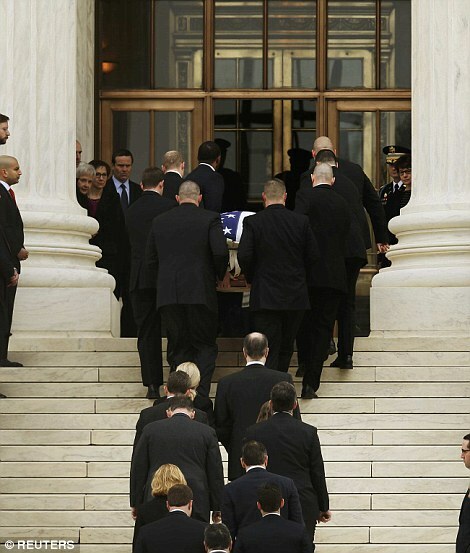 A portrait of Scalia painted by artist Nelson Shanks in 2007 will be placed next to the casket. In it, the justice is shown surrounded by images representing important moments and influences in his life, including a framed wedding photograph of his wife, Maureen. The doors to the court chamber were open at the east end of the hall. 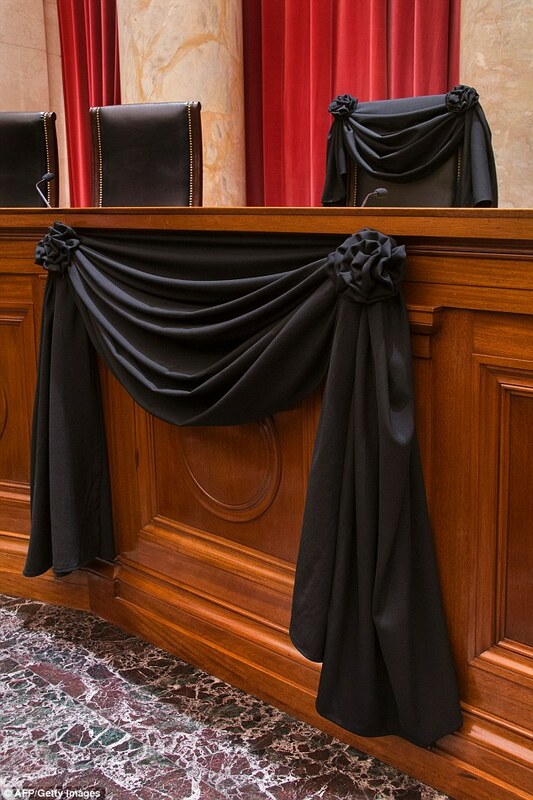 Black wool crepe hung over the entrance, and Scalia’s courtroom chair was draped in black. A private ceremony will be held inside the court until about 10.30am, after which the public will be able to view the casket until 8pm. The sudden death of the outspoken, conservative justice complicated an already tumultuous election year. Republicans, including a number of the party’s presidential candidates, say a replacement should not be named until the next president takes office. Obama has pledged to pick a replacement ‘in due time’ and challenged Republicans to hold a vote on his nominee. ‘The Constitution is pretty clear about what’s supposed to happen now,’ Obama said on Tuesday as he outlined his role as the executive to put forth a name to replace Scalia. The president said: ‘Historically this has not been viewed as a question. There’s no unwritten law that says that it can only be done on off years. That’s not in the Constitutional text.’ Obama wouldn’t promise to nominate a ‘moderate,’ consensus candidate, saying people should not ‘assume anything about the qualifications’ of the person he’ll pick ‘other than they’re gonna be well-qualified’. 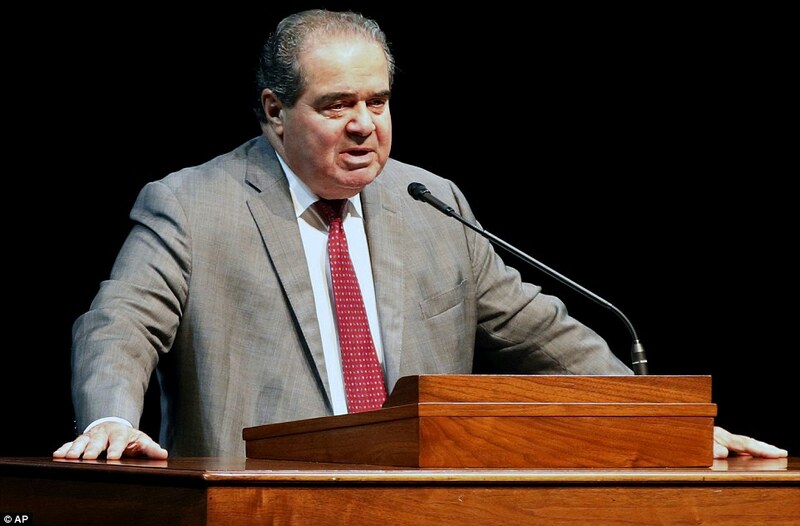 Scalia’s body was discovered in his bedroom at Texas ranch between 11.30am and 11.40am on Saturday morning. 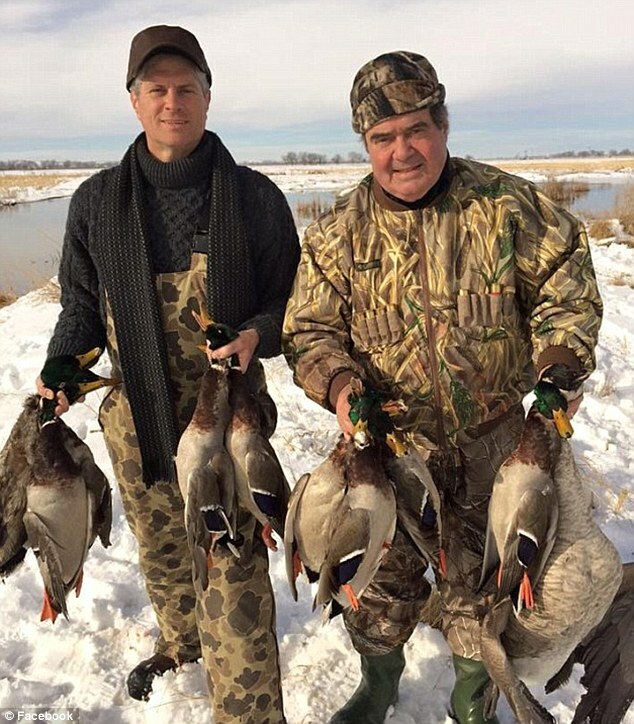 Scalia, who had a history of heart problems, had been enjoying a quail shoot at the property with friends but retired to bed early on Friday night after complaining of tiredness. The next morning, friends of the late Justice attempted to call him at around 8.30am but on getting no answer, decided to go out. On their return, at 11.30am, they broke into Scalia’s room and found him lying ‘cold’ in his bed. The Mass open to family and friends will take place Saturday at 11am at the Basilica of the National Shrine of the Immaculate Conception in Washington, DC. Burial plans have not been released. 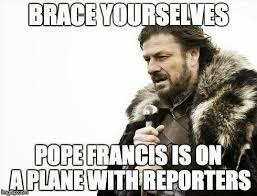 Vatican City, Feb 18, 2016 / 11:00 am (CNA).- In his hour-long in-flight news conference on his way from Juarez to Rome, Pope Francis touched on a wide range of hot-button topics, including immigration, pedophilia, the spread of the Zika virus and his meeting with Patriarch Kirill. 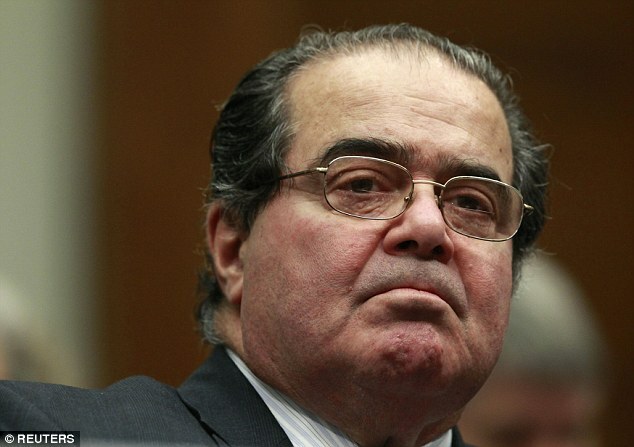 Justice Scalia Requiescat in pace. Enemy within, BHO said today that he won’t back down from a Supreme Court nomination battle brewing between his White House and Senate Republicans. 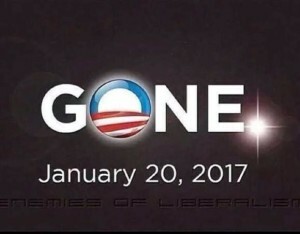 ‘The Constitution is pretty clear about what’s supposed to happen now,’ Obama said at a press conference as he outlined his role as the executive to put forth a name to replace deceased Associate Justice Antonin Scalia and U.S. senators’ responsibility to confirm or deny that choice. Obama was also asked as part of a question what factors he’d consider when making a decision such as race and political positions. CNN said in a report today that the president’s team has already begun the vetting process and is working off a lists is began when he filled two other positions on the court and replaced Eric Holder in the attorney general’s office. 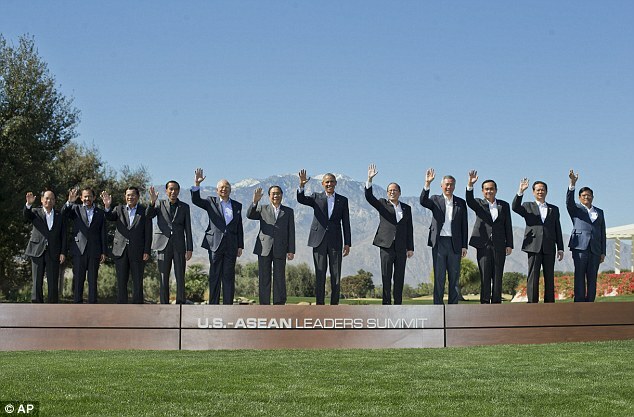 The president is currently in Rancho Mirage, California, hosting the Association of Southeast Asian Nations at Sunnylands resort and golf course. He returns to Washington tonight. By week’s end his team will have nevertheless narrowed down its list of options to three or four names, CNN’s source said. Attorney General Loretta Lynch, who has held the role of top cop for less than a year after spending five as a U.S. Attorney’s in New York, is considered a leading contender. Obama had little to say today about the candidates he’s considering. The fast of today is prescribed by a double law: it is Lent, and it is Ember Wednesday. It is the same with the Friday and Saturday of this week. 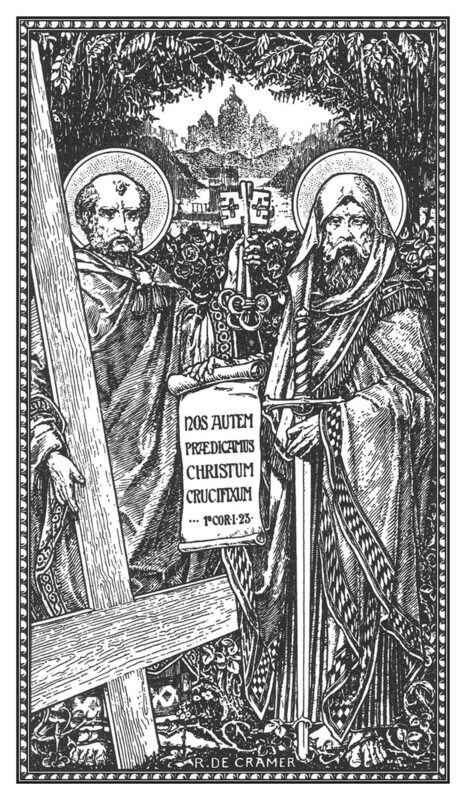 There are two principal objects for the Ember days of this period of the year: the ﬁrst is to offer up to God the season of spring, and, by fasting and prayer, to draw down His blessing upon it; the second is, to ask Him to enrich with His choicest graces the priests and sacred ministers who are to receive their Ordination on Saturday. Let us, therefore, have a great respect for these three days; and let those who violate, upon them, the laws of fasting or abstinence, know that they commit a twofold sin. Up to the eleventh century the Ember days of spring were kept in the ﬁrst week of March; and those of summer, in the second week of June. It was St. Gregory VII, who ﬁxed them as we now have them; that is, the Ember days of spring in the ﬁrst week of Lent, and those of summer in Whitsun week. 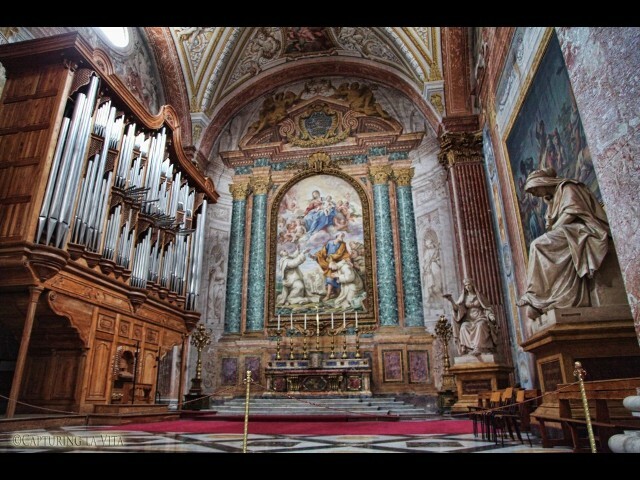 The Station for today is in the basilica of Saint Mary Major. Let us honour the Mother of God, the refuge of sinners; and let us ask her to present to our divine Judge the humble tribute of our penance. The Liturgical Year – Ven. Abbot Dom Prosper Guéranger, O.S.B. Reminiscere miserationum tuarum, Domine, et misericordiæ tuæ, quæ a sæculo sunt: ne umquam dominentur nobis inimici nostri: libera nos, Deus Isræl, ex omnibus angustiis nostris. Ps. Ad te, Domine, levavi animam meam: Deus meus, in te confido, no erubescam. Gloria Patri. Remember O Lord, Thy bowels of compassion and Thy mercies, that are from the beginning of the world; lest at any time our enemies rule over us; deliver us, O God of Isræl, from all our necessities. Ps. To Thee, O Lord, have I lifted up my soul: in Thee, O my God, I put my trust; let me not be ashamed. Glory to the Father. Let us pray. Let us kneel. Arise. Mercifully hear our prayers, we beseech Thee, O Lord, and stretch forth the right hand of Thy Majesty against all our foes. Through our Lord. The Epistle of the Mass for all the Ember Wednesdays consists of two lessons from sacred Scripture. 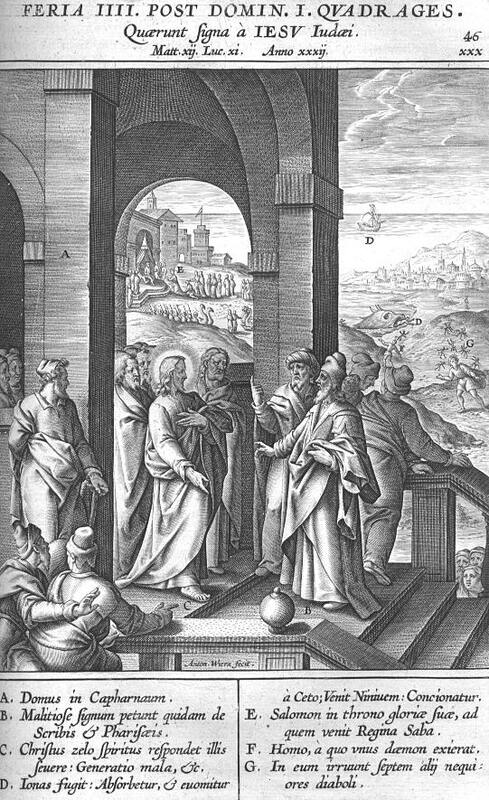 Today the Church brings before us the two great types of Lent, Moses and Elias, in order to impress us with an idea of the importance of this forty days’ fast, which Christ Himself solemnly consecrated when He observed it, thus fulﬁlling, in His own Person, what the Law and the Prophets had but preﬁgured. 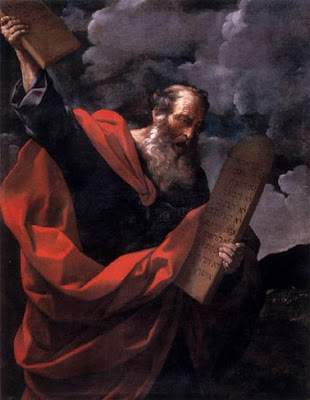 In those days the Lord said to Moses: Come up to me into the mount, and be there: and I will give thee tables of stone, and the law, and the commandments which I have written: that thou mayst teach them. Moses rose up, and his minister Josue: and Moses going up into the mount of God, said to the ancients: Wait ye here till we return to you. You have Aaron and Hur with you: if any question shall arise, you shall refer it to them. And when Moses was gone up, a cloud covered the mount. And the glory of the Lord dwelt upon Sinai, covering it with a cloud six days: and the seventh day he called him out of the midst of the cloud. And the sight of the glory of the Lord was like a burning fire upon the top of the mount, in the eyes of the children of Israel. And Moses, entering into the midst of the cloud, went up into the mountain: and he was there forty days, and forty nights. The troubles of my heart are multiplied: deliver me from my necessities, O Lord. See my abjection and my labour; and forgive me all my sins. Look down, favourably, we beseech Thee, O Lord, upon the devotion of Thy people, that they whose bodies are mortified by abstinence, may through the fruit of good works be refreshed in mind. In those days Elias came to Bersabee of Juda, and left his servant there, And he went forward, one day’s journey into the desert. And when he was there, and sat under a juniper tree, he requested for his soul that he might die, and said: It is enough for me, Lord, take away my soul: for I am no better than my fathers. 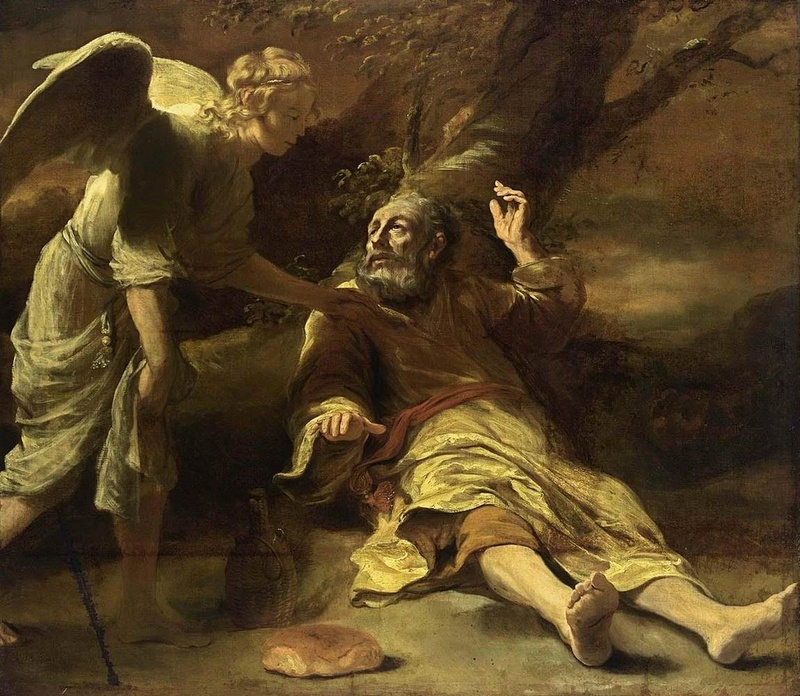 And he cast himself down, and slept in the shadow of the juniper tree: and behold an angel of the Lord touched him, and said to him: Arise and eat. He looked, and behold there was at his head a hearth cake, and a vessel of water: and he ate and drank, and he fell asleep again. And the angel of the Lord came again the second time, and touched him, and said to him: Arise, eat: for thou hast yet a great way to go. And he arose, and ate, and drank, and walked in the strength of that food forty days and forty nights, unto the mount of God, Horeb. Moses and Elias fast for forty days and forty nights, because God bids them come near to Him. Man must purify himself, he must unburden himself, in some measure at least, of the body which weighs him down, if he would enter into communication with Him who is the Spirit. And yet the vision of God granted to these two holy personages was very imperfect: they felt that God was near them, but they beheld not His glory. But when the fullness of time came, God manifested Himself in the ﬂesh: and man saw, and heard, and touched Him. We, indeed, are not of the number of those favoured ones who lived with Jesus, the Word of life: but in the holy Eucharist He allows us to do more than see Him: He enters into our breasts, He is our food. The humblest member of the Church possesses God more fully than either Moses on Sinai, or Elias on Horeb. 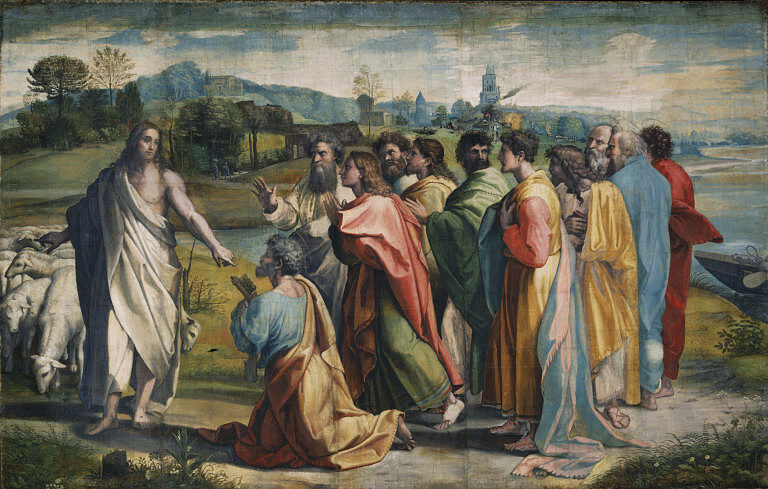 We cannot, therefore, be surprised that the Church, in order to ﬁt us for this favour at the Easter solemnity, bids us go through a preparation of forty days, though its severity is not to be compared with the rigid fast which Moses and Elias had to observe as the condition of receiving what God promised them. Deliver me from my necessities, O Lord: see my abjection and my labour; and forgive me all my sins. To Thee, O Lord, have I lifted up my soul; in Thee, O my God, I put my trust, let me not be ashamed; neither let mine enemies laugh at me. For none of them that wait on Thee shall be confounded: let all them be confounded that do vain things. At that time some of the Scribes and Pharisees answered Jesus, saying: Master we would see a sign from thee. Who answering said to them: An evil and adulterous generation seeketh a sign: and a sign shall not be given it, but the sign of Jonas the prophet. For as Jonas was in the whale’s belly three days and three nights: so shall the Son of man be in the heart of the earth three days and three nights. The men of Ninive shall rise in judgment with this generation, and shall condemn it: because they did penance at the preaching of Jonas. And behold a greater than Jonas here. The queen of the south shall rise in judgment with this generation, and shall condemn it: because she came from the ends of the earth to hear the wisdom of Solomon, and behold a greater than Solomon here. And when an unclean spirit is gone out of a man he walketh through dry places seeking rest, and findeth none. Then he saith: I will return into my house from whence I came out. And coming he findeth it empty, swept, and garnished. Then he goeth, and taketh with him seven other spirits more wicked than himself, and they enter in and dwell there: and the last state of that man is made worse than the first. So shall it be also to this wicked generation. As He was yet speaking to the multitudes, behold His mother and His brethren stood without, seeking to speak to Him. And one said unto Him: Behold Thy mother and Thy brethren stand without, seeking Thee. But He answering him that told Him, said: Who is My mother, and who are My brethren? And stretching forth His hand towards His disciples, He said: Behold My mother and My brethren. For whosoever shall do the will of My Father, that is in heaven, He is My brother, and sister, and mother. Our Lord forewarns Israel of the chastisements which its voluntary blindness and hardness of heart will bring upon it. The men of Israel refuse to believe, unless they see signs and prodigies ; they have them in abundance, but will not see them. Such are the unbelievers of the present day. They say they want proofs of the divine origin of the Catholic religion. What is history but a tissue of proofs; what are the events of the present age, but testimony of the truth? And yet they remain incredulous. They have their own views and prejudices, and they intend to keep to them; how, then, can it be wondered at that they never embrace the true faith? Inﬁdels, who have not had the like opportunities, will rise in judgment with such a generation and condemn it for its resistance to grace. Let us Catholics remember that amidst the great religious movement which is now going on, it is our duty to be not only most ﬁrm in our faith, but also most zealous in the observance of the laws of the Church, such, for example, as Lent. The apostolate of example will produce its fruits; and if a mere handful of Christians was to the Roman empire like that leaven of which our Saviour speaks, and which leavened the whole mass, what results might we not expect in a country like our own, which has retained so much Catholic practice and doctrine, if the Catholics themselves were but zealous in the exercise of their duties’? I meditated also on Thy commandments, which I loved exceedingly: and I lifted up my hands to Thy commandments, which I loved. We make sacrificial offerings to propitiate Thee, O Lord, so that in Thy mercy Thou mayest forgive us our sins and Thyself guide our wayward hearts. Through our Lord. Understand my cry: hearken to the voice of my prayer, O my King and my God: for to Thee will I pray: O Lord. 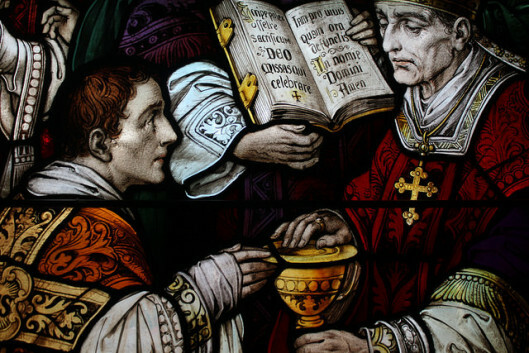 By the reception of Thy Sacrament, O Lord, may we both be cleansed from our secret sins and delivered from the snares of our enemies. Enlighten, we beseech thee, O Lord, our minds with the light of thy brightness, that we may discern what is to be done, and be able to do it. Through Christ our Lord. Amen. We take the following devout stanzas on fasting from the Triodion of the Greek Church. Wonderful is the armour of prayer and fasting! With it, Moses became a legislator, and Elias a zealous priest. Let us, O ye faithful, resolutely take it unto ourselves, and cry out to our Saviour: To thee alone have we sinned; have mercy on us. Let us fast a spiritual fast, break all the snares of the serpent, shun the wickedness of evil example, and forgive our brethren their offences against us, that our own sins may be forgiven; for thus shall We be able to say: May our prayer, O Lord, be directed as incense in thy sight! O thou that alone art Good! O fount of mercy! 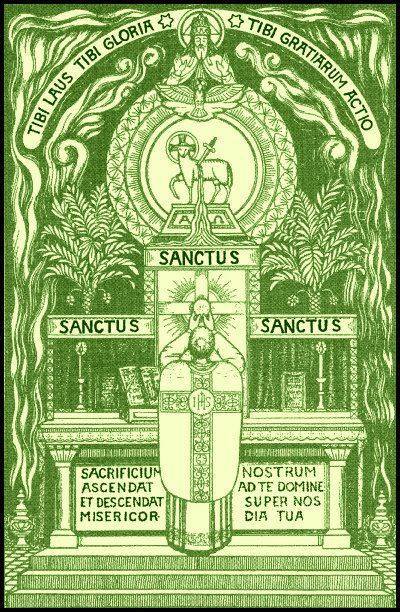 O Lamb of God, who, being thyself God, takest away the sins of the world! I am tossed by the storms of sin; save me, and lead me to the paths of penance. The true fast is ﬂeeing from sin, turning away from evil affections, love of God, earnest prayer, tears of compunction, and charity towards the poor, as Christ teaches us in the Scripture. My soul is pierced with the sword of sin, and is mangled by manifold crimes: heal it, O thou kind physician of souls! Apply unto me, O merciful Jesus, the remedy of thy all-wise commandments. 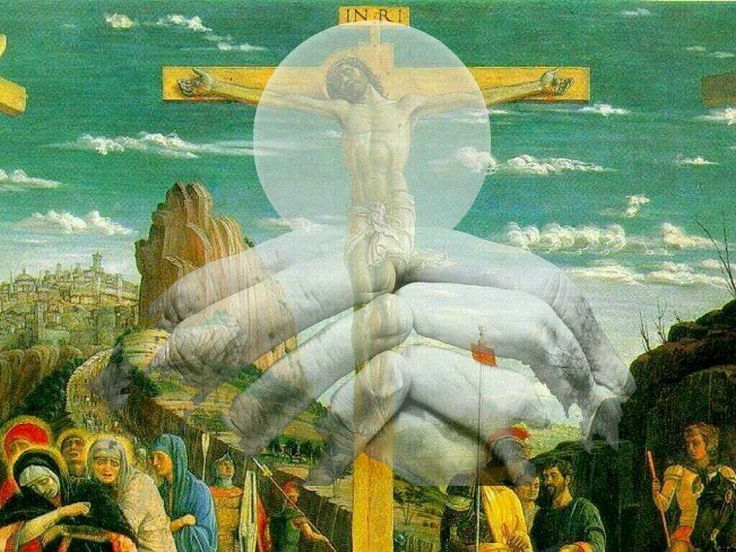 Now is the time for compunction, for it is the time of the fast; let us earnestly give ourselves to tears and sighs, and stretch forth our hands to our only Redeemer, beseeching him to unfetter our souls. Give me the grace, O my good Jesus! to stiﬂe all my wicked affections, to be ﬁlled with the love of thee, to be rich in divine gifts, and to serve thee with all devotedness. Take heed, my soul, lest, whilst fasting, thou be guilty of the gluttony of injuring and hating thy neighbour, and quarrelling with him; and thus lose thy God, by thy negligence. How shall I be able, O my Jesus, to endure thy wrath, when thou comest to judge me? What answer shall I then make unto thee, if new I refuse to fulfill thy just commands? O pardon me, before my departure hence. Liberate my soul, O Lord, from the tyranny of my passions, that I may enjoy the freedom of doing thy will, and give glory to thy power, for eternity. Hate, O my soul, the intemperance of Esau, and imitate the holy Jacob; destroy Belial by abstinence, make treasure to thyself of divine riches, and let the praise of God be for ever on thy lips. Grant unto us, O merciful Saviour, that we may traverse the sea of our fast unmolested by storms: and that we, who are ever celebrating thy praise, may be brought to the haven of thy Resurrection. The station for today is, as noted in the missal, in the church of St. Trypho, martyr; but this church having been destroyed many centuries ago, the station is now in that of St. Augustine, which is built on the same site. Give ear, O Lord, to our prayers, and grant that we may, with true devotion, ob serve this solemn fast which was wholesomely instituted for giving health to both our souls and bodies. Through Christ our Lord. Amen. Thus saith the Lord God: If thou wilt take away the chain out of the midst of thee, and cease to stretch out the ﬁnger, and to speak that which proﬁteth not; when thou shalt pour out thy soul to the hungry, and shalt satisfy the afﬂicted soul, then shall thy light rise up in darkness, and thy darkness shall be as the noonday. And the Lord will give thee rest continually, and will ﬁll thy soul with brightness, and deliver thy bones, and thou shalt be like a watered garden and like a fountain of water, whose waters shall not fail. And the places that have been desolate for ages, shall be built in thee; thou shalt raise up the foundations of generation and generation: and thou shalt be called the repairer of the fences, turning the paths into rest. If thou turn away thy foot from the Sabbath, from doing thy own will in my holy day, and call the Sabbath delightful, and the holy of the Lord glorious, and glorify him, while thou dost not thy own ways, and thy own will is not found, to speak a word: then shalt thou be delighted in the Lord, and I will lift thee up above the high places of the earth, and will feed thee with the inheritance of Jacob thy father. For the mouth of the Lord hath spoken it. Saturday is a day replete with mystery. It is the day of God’s rest; it is a ﬁgure of the eternal peace, which awaits us in heaven after the toils of this life are over. The object of the Church in giving us, today, this lesson from Isaias, is to teach us how we are to merit our eternal Sabbath. We have scarcely entered on our campaign of penance, when this affectionate mother of ours comes to console us. If we abound in good works during this holy season, in which we have taken leave of the distracting vanities of the world, the light of grace shall rise up even in the darkness which now clouds our soul. This soul which has been so long obscured by sin and by the love of the world and self, shall become bright as the noonday; the glory of Jesus’ Resurrection shall be ours too; and, if we are faithful to grace, the Easter of time will lead us to the Easter of eternity. Let us, therefore, build up the places that have been so long desolate; let us raise up the foundations, repair the fences, turn away our feet from the violation of holy Observances, do not our own ways and our own will in opposition to those of our divine Master; and then He will give us everlasting rest, and ﬁll our soul with His own brightness. At that time: When it was late, the ship was in the midst of the sea, and Jesus alone on the land. And seeing them labouring in rowing (for the wind was against them), and about the fourth watch of the night, he cometh to them, walking upon the sea, and he would have passed by them. But they seeing him walking upon the sea, thought it was an apparition, and they cried out. For they all saw him and were troubled. And immediately he spoke with them, and said to them: Have a good heart, it is I, fear ye not. And he went up to them into the ship, and the wind ceased. And they were far more astonished within themselves: for they understood not concerning the loaves: for their heart was blinded. And when they had passed over, they came into the land of Genesareth, and set to the shore. And when they were gone out of the ship immediately they knew him; and running through that whole country, they began to carry about in beds those that were sick, where they heard he was. And whithersoever he entered, into towns, or into villages, or cities, they laid the sick in the streets, and besought him that they might touch’ but the hem of his garment: and as many as touched him were made whole. The ship, the Church, has set sail; the voyage is to last forty days. The disciples labour in rowing, for the wind is against them; they begin to fear lest they may not be able to gain the port. But Jesus comes to them on the sea; He goes up to them in the ship; the rest of the voyage is most prosperous. The ancient liturgists thus explain the Church’s intention in her choice of today’s Gospel. ‘Forty days of penance are, it is true, little enough for a long life that has been spent in everything save God’s service; and yet our cowardice would sink under these forty days, unless we had Jesus with us. Let us not fear; it is He; He prays with us, fasts with us, and does all our works of mercy with us. Was it not He that ﬁrst began these forty days of expiation? Let us keep our eyes ﬁxed on Him, and be of good heart. If we grow tired, let us go to Him, as did the poor sick ones of whom our Gospel speaks. 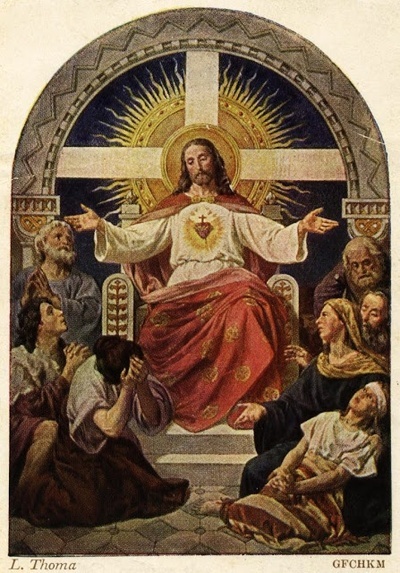 The very touch of His garments sufﬁced to restore health to such as had lost it; let us go to Him in His adorable Sacrament; and the divine life, whose germ is already within us, will develop itself, and the energy, which was beginning to droop in our hearts, will regain all its vigour. May thy faithful, O God, be strengthened by thy gifts; that, by receiving them, they may ever hunger after them, and hungering after them, they may have their desires satisﬁed in the everlasting possession of them. Through Christ our Lord. Amen. Let us close our Saturday with a prayer to Mary, the refuge of sinners. Let us express the conﬁdence we have in her, by the following devout sequence. It is taken from the German missals of the fourteenth century. It behooves us, O most holy Virgin, to offer thee, on the altar of our hearts, the offering of our prayers. For whereas the sacriﬁce of our prayers has no merit of its own, it may be made acceptable, through thee, to thy Son. Present to him, who was sacriﬁced for sin, the sacriﬁce of sinners’ prayers. It is through thee the sinner comes to God, for this God came to the sinner through thee, O thou the mediatrix between God and man! 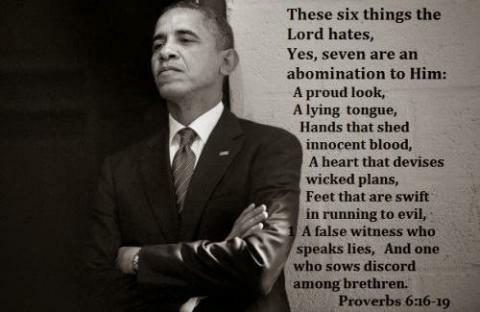 It was for the sake of sinners that thou wast made worthy of such a Son: canst thou, then, despise them? It was because there were sinners to be redeemed, that thou wast made Mother of the Redeemer. Neither wouldst thou be seated nigh the Father’s throne, hadst thou not been Mother of him who shares his Father’s throne. Take, then, O holy Virgin, who for our sake hast been thus exalted, take thou our prayers, and present them to our sovereign Lord. Amen. People today are not normal or sane. All history shows no comparable bane. “Modernism is necessarily, by its very nature, a uniquely slippery animal.” Modernism being the present deadly enemy of the Catholic Church, it can never be analyzed enough. As enemy of the Church in particular, it can be defined as that movement of thought and belief which holds that the Church must be adapted to the modern world by the appearance of Catholicism being maintained while its substance is changed. 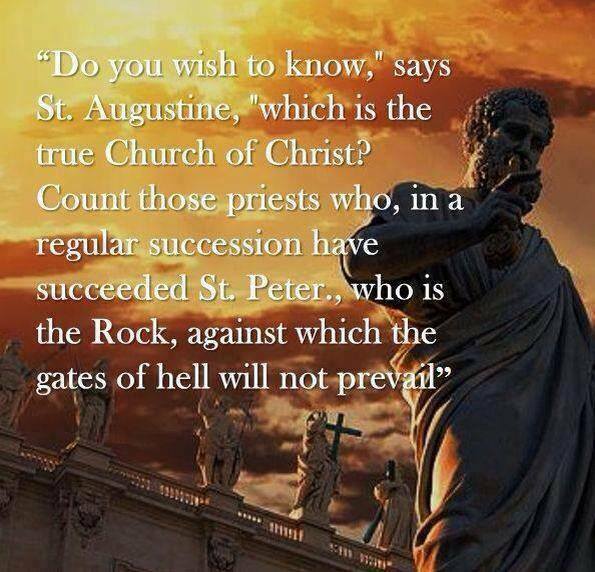 It has infected Catholics without number since it gained official approval from the very top of the Church at Vatican II, and it has set many cardinals, bishops and priests on the road to eternal perdition, let alone laity, by undermining their Catholic faith. Let us see again why it is slippery, and uniquely slippery. It is a slippery animal because like all heresies it had to disguise itself to seem acceptable to its target, believing Catholics. So it is constantly using ambiguous formulae of words interpretable in a Catholic or anti-catholic sense. The Catholics piously accept the Catholic sense and swallow the words, only to have the modernists turn them to poison by exploiting the anti-catholic sense. 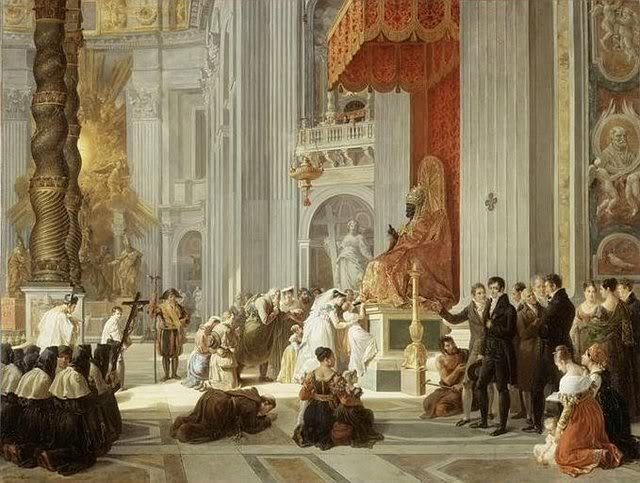 Vatican II is ambiguous from start to finish, choosing formulae of words that can slip and slide between the Church and the modern world, so as to hide the intrinsic mutual contradiction of these two. To Paul VI, believing profoundly in both Church and world (as he conceived them), such formulae came instinctively and abundantly. The documents of his Council, Vatican II, are shot through with ambiguity. Yet by these ambiguities Paul VI really thought he would save both Church and world, exactly as Bishop Fellay now hopes that by talking out of both sides of his mouth he will save both Catholic Tradition and the Council. Vain hope! God “detests the double tongue” (Prov. VIII, 13). It has always served to trick Catholics into abandoning their faith. But more than just slippery, modernism is amongst all heresies uniquely slippery, because as Pius X said in “Pascendi,” it is the heresy of heresies, like a main sewer collecting in itself all the filth of all the minor sewers, or particular heresies. This is because it is the product (and producer) of minds that have slipped anchor from anchorage in any truth whatsoever, so that any counter-truth or heresy is entirely at home in modernism. And this is because its fundamental principle is philosophical, the human mind’s supposed inability to know anything whatsoever beyond what appears to men’s five external senses. Such a mind is like a dirty wine-bottle. It dirties anything poured into it, even the finest of wines or the sublimest of truths. For while any other heresy attacks a particular truth of the Faith, the philosophical error at the root of modernism undermines universal truth, even while it can pretend that it is not attacking any truth in particular. For instance Benedict XVI would no doubt be horrified if he were accused of disbelieving any Article of the Creed, but that does not stop him from being ready to “up-date” them all. Now never have so many minds slipped all anchor in objective truth as today, such slipping being man’s final liberation, whereby reality can no longer impose itself on me, but I can impose myself on all reality. I have taken the place of God. Thus too many Catholics were infected by today’s world and welcomed modernism when it reared its head again at Vatican II, because here was the Pope himself giving the apparent seal of Catholic approval to their undermining of all Catholic Truth. They were free, and still Catholic. Cry freedom throughout the Church! Then how deal with this “uniquely slippery animal?” Certainly not by going down to Rome to mix with its main victims and perpetrators, the present officials at the top of the Church. Satan himself might not have a long enough spoon to sup safely with these (objective) foxes and sharks and wolves, all the more dangerous for their possible (subjective) unawareness of their own condition. Pray the Rosary for Our Lady to build around your heads and hearts her own protective armour.